How we implement the "process" is a key factor in our students future achievements. If you skip over introducing basic essentials and developmentally appropriate skills, the end result may not be as authentic or solidified. Do not race to the finish, keep a slow and steady pace for authentic learning. Sounds all good, but how exactly do we do that? As I prepare for my the new school year, I will share my plan to allow my students to fully explore during center time before I even attempt to involve them in independent learning. For the second time in 2 years, I have a little boy entering kindergarten and it is REALLY hitting home with me that, as smart as he is, the structure of school and learning is going to be an overwhelming new world for him. He is the sweetest little thing (see him below, so cooperatively demonstrating a classroom management technique I use at the beginning of the year-the "monkey face") but wants to please and do things the "right" way. Although he may not represent the majority of 5 year olds, I know he is like many, and my question is how do we make sure that children with this type of personality feel successful and happy in their new world? If I have learned anything from my little boys, it is that if they have enough time "playing" with (a.k.a. exploring) something and becoming comfortable with it, then they will be prepared to execute higher level learning and functioning with it. Of course, these are all things we "know", but it is very powerful to have it demonstrated right in front of you on a daily basis via your own children. It is so simple--take the time to allow your students to "explore" your classroom, your manipulatives and the future of their learning. Taking the time to do this exploration will buy you more time than you could ever ask for in management, learning and creating a happy, successful environment for your new students. For the purpose of this article, I am going to focus on 4 centers that I will be using as "staple" centers all year long during both literacy and math center time. 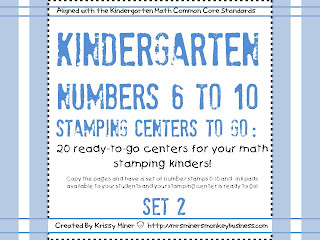 Having "staple" centers will help you in creating independent learners during center time because it is something they have already explored and feel comfortable with. Of course, the skills will increase over time, but, if done appropriately, the students will not notice the increasing level of difficulty, but will feel confident with the changes. 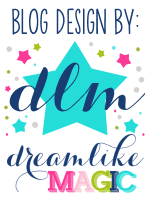 So, my darling little Dawson was the inspiration behind the following stamping freebies that I am going to share with you today. 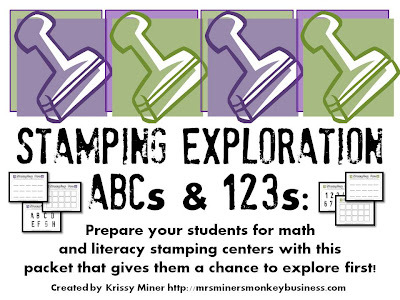 Basically, it is a somewhat structured way to allow the kiddos to explore the stamps, the ink and the paper before being asked to do any constructive work with them. Providing them with washable ink allows me to let them make hand prints and fingerprints the very first day. I tell them this is a one shot deal---trust me they will do it anyway, why not allow them to do it in a somewhat structured manner now instead when they are supposed to be working later on in the year? Have them put their 2 hands on a paper, along with their 10 fingerprints. You can call me nuts, but I would rather get it all over with one time when they have my permission than having to stop small groups 20 different times to discuss how they are supposed to be stamping the paper and not skin! You can use the top photo as the model at this exploratory center and then bottom one is for the students to recreate what they see here (in a fun color, of course!). Click on this picture to grab this freebie. can be purchased bundled together at a lower price than when purchased separately. when the pin is not in use, it goes back in its home (a rectangular, pink eraser). It is VERY easy and (contrary to popular worry), I have never had a student poke anyone other than themself by accident. This is a programmable freebie I made to introduce pokey pins. There are many ways to utilize it, but the two ways I do it are to do the first letter of each student's name AND then we do the entire alphabet with uppercase letters, then lower case letters to hang in our windows (created on colorful paper that matches our room colors, of course!). Here are the centers that I am preparing my students for during this exploratory phase. Again, there are more than enough for the entire year. You are building their hand strength (a commonly left out skill in today's kindergarten curriculum) while reviewing concepts like letter identification, letter-sound correspondence, sight word recognition, number and number word recognition AND 3D and 2D shapes. Marsha from A Differentiated Kindergarten is the one who introduced me to I Spy centers. As soon as I found out about them, they quickly became a staple in both my math and literacy centers. The greatest thing about every single one of Marsha's products is that they are all differentiated, which is something I feel very strongly about. When you get a freebie or purchase a product from Marsha, the differentiation is ALL READY done for you! It is AmAzInG. 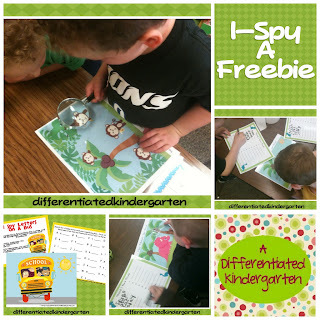 I Spy centers are colorful and bright scenes that may (or may not) represent your current theme and hidden inside the picture are tiny letters, words, numbers or math problems that students use their trusty magnifying glass to find. As the level of difficulty in this center increases, there are multiple ways for this center to be recorded according to ability. 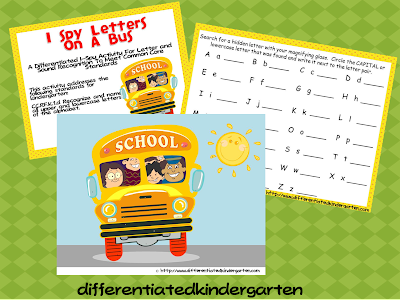 To start this center off in exploration mode, just give them a variety of these I Spy centers (color printed and laminated) and magnifying glasses and let them become detectives. Let them try every single kind of magnifying glass you have available (they NEED to do that in this phase). Let them show each other their enlarged eyes, let them look at things around the room with the variety of magnifying glasses you have. They WILL do this whether or not you allow them the opportunity, so why not get it all over with at once. I have magnifying sheets that they NEED to make faces into a bazillion times to "get over it". Once all of their playing exploring is done and only then, they will be ready to Spy to Learn! here is a simple abc write the room . . . included in packet is the option to just look for the cards and write letters in their name and not in their name. SIMPLE way to start. If that gets to easy then you hand them the next tier response sheet which might be find capitals and lowercase letters and so on. Writing the room is a favored center all year round for both literacy AND math. Students need to move, so why not make them move AND learn at the same time. Seems like a given to me! You can find Write the Room centers all over the internet, some free, some paid, but I can guarantee you will not find them as colorful, easy to set up AND differentiated like the ones that Marsha from A Differentiated Kindergarten has them. During the exploratory phase of writing the room, you will want to introduce them to the beloved clipboards. Let them have the clipboards, tell them about the child who cut off a finger by way of the metal clip warn them of the dangers and let them clip away. See who can make the loudest sound with theirs...see who can clip a paper in the quickest and see who can clip the most paper in at once...then let them write with their paper turned upside down....I am telling you-get this funny business out of the way and they won't care about doing it over and over while they are supposed to be learning! Once you have that fun stuff out of the way, you can let them just check off or x out pictures they find around the room without actually recording anything. Some of them will naturally start recording anyway, but the pressure isn't there to HAVE to do that quite yet. Next, if you plan on tiering your centers, get them used to only finding THEIR pictures (denoted by colored frames or other clever techniques that only Marsha could come up with!). Click on the little picture below to check out this product. You are awesome!! Thanks so much for sharing your ideas and freebies! Wow! Thank you so much for this great post! Thanks for sharing. What kind of stamps do you use? Any favorite kind of ink? Thanks for the freebies!! I love your Pokey Pin activities, they are perfect for those little guys working on fine motor skills! This is absolutely wonderful! Thank you so much! Krissy - this is am amazing post!! I can see using the handprint as a way to make a skip-counting display (we count their finger, hands, set of hands)..... Also LOVE the pokey pins - can see doing this with their names at the beginning of school! Thanks so much! Thanks for the freebies! And thank you for the reminder to slow down and trust in the process. This is going to definitely help me this school year. I already feel less stressed, thanks! Hello to everyone and thanks for stopping by to comment! I get those big circular, washable ink pads from Lakeshore. It comes in a pack of many so you can change the color weekly (it's the small things, right?). I have had my letter stamps for years, but I believe I also got those at Lakeshore. You are all so very welcome for the freebies. I love to share! Wow! 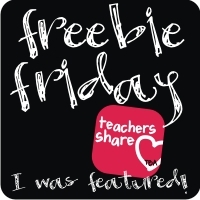 I love these ideas and freebies! Thanks for posting it. I will surely use it. My kids will love these. Wow, you just gave us so much rich detail and fun activities. Thank you! Love the "I Spy" differentiation. Good luck sending off your new Kindergartener! Thank you for this amazing post. With all the pressure from CCSS coming, it is difficult to feel comfortable knowing we're doing what we "should" to comply and still delivering excellent learning. When told recently "there's no time to play" I scoffed--these babies NEED play, and if you can make centers FUN they WILL learn!!! These are terrific ideas to allow them that discovery/play time that will resound in their minds and make it meaningful learning that builds the foundation I think we're all looking for! Thanks again...and your little fella is quite a cutie pie! It's so hard letting them go :) Hope your year gets off to a fabulous start. Wow, such great information! I love reading what everyone does in their rooms. I always gain a tip or two! Your 'Trust the Process' hits home. We are all in such a CC scramble! I need to print that and put it on my desk!! SOOOO helpful! As a first year kindie teacher...THANK YOU!